The team has to recreate a design comprising equilateral triangles (created by the designer) by asking as few questions as possible. You will be working in a team of four or five. You will need two sets of 12 triangles three each of four colours. 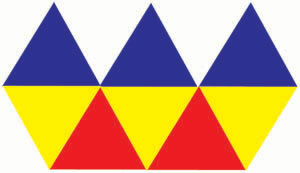 The image above uses 8 triangles of 3 different colours. You might wish to start with just two colours and fewer triangles until you have some experience of the task. Give one set of triangles to the designer and the other identical set to the rest of the team. Without the rest of the group seeing, the designer creates a design of touching triangles using some or all of the triangles available. Triangles must have one side horizontal and touch at least one other triangle along at least one side, with no overlap. Using the rules for asking questions, and checking that they all agree first, the team takes turns to ask the designer questions that will help them recreate the triangle design. When the team thinks they have the correct design they can check with the designer and the task ends. At the end, the observer gives feedback about the way the team worked together, highlighting strengths and ways that they could improve next time. The team discuss the feedback and how they think they worked. The team must take turns in asking questions. The designer can only answer "Yes", "No" or give a number or a colour. You do not have to use all the triangles. Triangles must have a horizontal side. All triangles must touch at least one other triangle. The sides of adjacent triangles must touch along the whole of their length. You can only answer "Yes", "No", with a colour or a number. the number of triangles in each "row'"
any "holes" in the design. Note: you cannot ask the designer to describe the position of a particular triangle. Real world. Working systematically. Cubes & cuboids. Mathematical reasoning & proof. Games. Team-building. Regular polygons and circles. Visualising. Interactivities. PrimaryGames-Strategy.